In recent time we have seen great growth in HD video technology. Nowadays Full HD TV,Computer monitors are becoming very popular. High end mobiles can record 1080p videos. After reading this news I’m sure you will want more pixels in your HDTV. Recently Sharp demonstrated world’s first 85 inch LCD TV with breathtaking 7,680 x 4,320 resolution. Yes you read it right it’s 7,680 x 4,320 pixels. This LCD TV has 16 times more pixels than current best Full HD (1920×1080) displays. This LCD TV will be world’s first TV to support Super High-Vision television broadcast format. Did I mentioned that this TV can show awesome 33 Megapixel videos. Super High-Vision television broadcast can show 33 Megapixel Video along with 22.2 Channel sound! Currently there is no commercial video camera available that can record at this resolution and there is no video card which can show 7,680 x 4,320 videos. Sharp has not announced any details about it’s commercial ability. This was a prototype LCD TV . 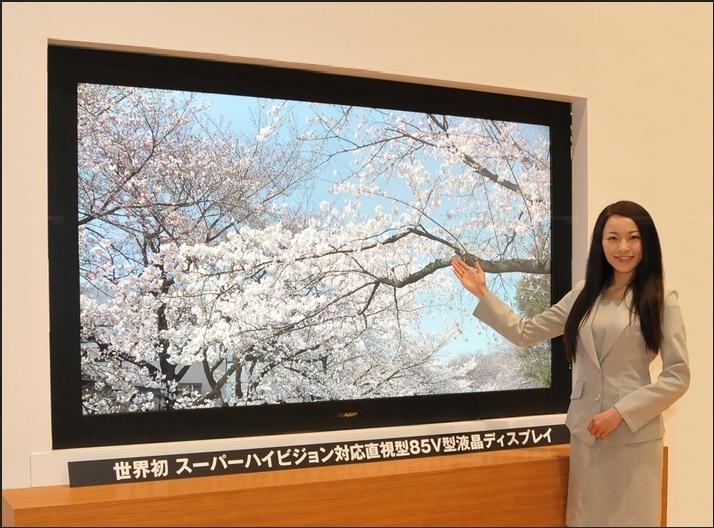 Sharp will demonstrate this TV in NHK’s Science & Technology Research Laboratories in Tokyo from 26th to 29th May. Looks like we have to wait for some more years to experience these great TV. How to turn any HDTV into a Smart TV?